In his own words, Ron Burgundy was put on this planet ‘to have salon-quality hair and read the news’. The hero of two Anchorman films, he’s more than fond of a glass of ‘Scotchy Scotch Scotch’ – and even inspired a real-life whisky. Richard Woodard reports. According to his official biography, Ronald Joseph Aaron Ron Burgundy is a five-times Emmy Award-winning journalist, who anchored KVWN Channel 4 News in San Diego (pronounced, of course, San Dee-argo) from 1964 to 1977. Made in the same silly spirit as Dodgeball or There’s Something About Mary, the Anchorman films – Anchorman 2: The Legend Continues followed almost a decade later – plough a broad comic furrow that eschews political correctness and plays just about everything for laughs – the more puerile the better. Directed by Adam McKay from an endlessly quotable script – ‘It is anchorman, not anchorlady – and that is a scientific fact!’ … ‘I’m in a glass case of emotion!’ … ‘By the beard of Zeus!’ – the first film was a slow burner that eventually acquired cult status, but almost didn’t get made at all. Ferrell and McKay were both working on Saturday Night Live when they wrote a script called August Blowout, later described by Ferrell as ‘like Glengarry Glen Ross meets a car dealership’. That didn’t get made but, encouraged by director Paul Thomas Anderson, they went on to develop Anchorman. But not the Anchorman we know. The original script involved a crashed planeload of newsmen pursued by murderous orang-utans wielding throwing stars; amazingly, it was thought a little too off-the-wall to be taken any further. The next version was made – but its plot involving the news team chasing a group of hippie bank robbers tested badly, so the film was extensively reshot, inserting the running story of a pregnant panda at San Diego Zoo. Both films’ plots – the first involving the arrival of an ambitious female news anchor, the second Burgundy’s comeback on a CNN-like rolling news network – are all but incidental, simply providing some kind of flimsy structure to link the laughs. Something of the surreal flavour of that original Anchorman concept remains: for instance, when an angry biker, hit by a burrito flung through a car window, punts Burgundy’s dog, Baxter, off a road bridge into a river. Or, in the sequel, when Burgundy is temporarily blinded in a freak ice-skating accident while playing jazz flute. And that’s about it. But no matter; that ‘Scotchy Scotch Scotch’ clip has already done its work. 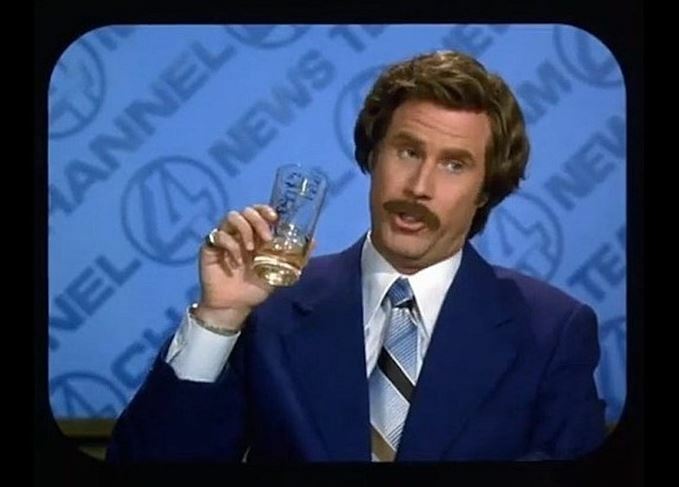 So much so that a real Scotch whisky, Ron Burgundy Great Odin’s Raven Special Reserve, was released to coincide with the release of the second film. Made by Old St Andrews for Paramount and Riviera Imports, the US$25 blend was variously reported to be a mix of 60% malt and 40% grain, or 30% malt and 70% grain (more likely, given the price). Featuring whiskies ‘from Speyside, the Highlands and Islay’, it was an immediate hit – Riviera Imports CEO Ed Caan told Fox Business that an initial shipment of 72,000 bottles sold out in days. Its success was no doubt aided by the many nods to the films in its publicity: ‘It has a formidable scent,’ Burgundy is quoted as saying. ‘It stings the nostrils – in a good way. There have been many attempts to find the real-life inspiration for Ron Burgundy. Some point to Harold Greene, a California news anchor and reporter; others mention Mort Crim, a retired anchorman who worked out of Philadelphia and Detroit. For UK fans, there’s something of Alan Partridge about Burgundy – a ridiculous, sometimes downright offensive figure of fun who still somehow manages to elicit some sympathy and affection from his audience. And in the meantime? You stay classy, whisky lovers.